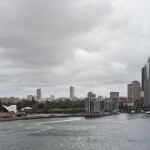 I am quite sure that it is impossible to tire of Sydney Harbour, especially when one is viewing it from a cruise ship sailing under the iconic Harbour Bridge; champagne in hand, band playing, people grinning, pointing and posing for selfies…and it didn’t matter one jot that the sky was overcast and the wind ‘blowy.’ Breezing through those ‘heads’ was exhilarating! What a sweet way to spend a mid-term break – 4 nights aboard the Dawn Princess for a little jaunt to Melbourne via Hobart. Even better when a special occasion is involved…celebrating a friend’s birthday. This was a short repositioning cruise (in preparation for a voyage to New Zealand), and provided a lovely two-full-days-at-sea-opportunity to gorge, chat, sip cocktails, play trivia, read, eat some more and zumba to our hearts content. Although, I have to admit that I only watched the zumba while getting in early for a good position for the jackpot bingo game, but I did fall in love with a few new cocktails, which I will now add to my ‘repertoire’! 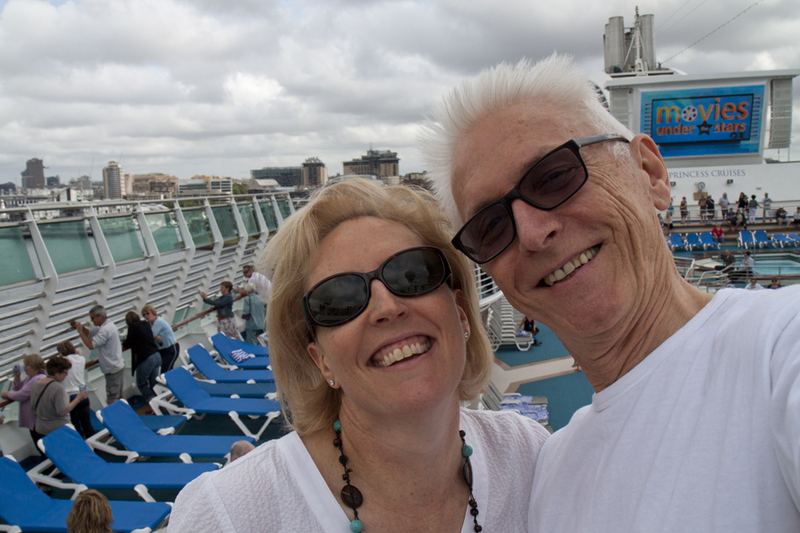 This was our second time on the Dawn Princess – our previous journey was out of Sydney to Noumea and Vanuatu. We once again went with an inside cabin, which would freak some people out, but when so little time is spent in the cabin, it didn’t bother us at all. In fact, I do like the complete darkness for a good night’s sleep. Yes, it was small, but well-designed, and once unpacked with the suitcases under the bed, there was a place for everything. For those not needing to snuggle with their loved one, the configuration of 2 single beds would provide more space in the cabin, and there would be no need to negotiate the tricky ends of the bed to get to the bathroom in the middle of the night. As we were travelling with friends, we honestly didn’t even scratch the surface in terms of partaking in what was on offer on board ship – we only saw one full show and played a few social games run by the entertainment staff. But that’s the point of a cruise – you can travel to meet new people, or you can isolate yourselves with your own personal party and do whatever you fancy – in our case, we played lots of cards and enjoyed far too many cocktails! We only saw one full show while on board; a male cabaret singer who performed a vocal impersonation of Elvis Presley combined with a comedy routine. His low notes were truly lovely, however, the high bits, especially towards the end of the show, were a little cringe-making. This was a bit of a shame, as it was his last cruise and I am sure that when he started doing this gig many years ago, the singing would’ve been stronger in the top end. 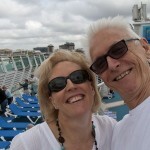 The jokes, surprisingly, were quite good – the first time I’ve laughed at a comic on a cruise ship! When we landed in Hobart, we headed to Lark’s Distillery for a bit of a tasting. We were very glad we chose this place – the whiskey was outstanding AND they even had an apple brandy (Australia’s only, apparently). We chose a whiskey that had been aged in a bourbon barrel (58% proof!) and the apple brandy to purchase, but were more than a little disappointed that the ‘tasting’ fee was not deducted from the significant purchase (and, believe me, it WAS a significant cost!). Lark’s really need to rethink that policy – it comes across as more than a tad mean spirited. Some more wandering throughout the city led to a snap decision to meet friends at Australia’s first casino (Wrestpoint) for lunch. This was probably the lowest point of our 4 days. We were all incredibly unimpressed with the service at the restaurant, Pier One. We turned up as a large group without a booking at about 1pm, the restaurant was virtually empty, so not having a reservation was not an issue (and we probably should’ve heeded the emptiness – but the ‘Point to Pinnacle’ race was on that morning, and we assumed the rest of the city was recovering!). The waiter had to make up a table for our group and when he appeared to be finished we started to amble in his direction. He approached us and curtly asked us to sit in the waiting area until he had the table ready. We did. Once we had been given his permission to approach, we took our seats only to discover missing glasses and place settings, which, after some time we decided to fetch ourselves from other empty tables nearby. We probably should’ve taken the hint left by the previous diners at a neighbouring table – their plates had hardly been touched (and certainly had not yet been cleared!). We had been left with menus and were sitting there for about 10 minutes when 3 customers were seated nearby. Our waiter still hadn’t taken our drinks order at this point, and when 5 minutes later he approached the table of 3 to take their order, we all just thought, “that’s enough” and got up and left. Shocking service. When the waiter saw that we were gathering our things, he did leave the other customers and came over to us, and asked was there a problem. One of our friends, simply said, “We’re leaving,” and we walked out. Not quite sure why this place is even still in existence – surely, if one wishes to gamble, a tired old thing built in the 70s in Hobart isn’t the place you’d go to…? And the real estate would be worth a fortune! We dumped the casino and headed back to the fishermans wharf area to find some good seafood for our mates. But by the time we arrived, most places were packed, so we just kept walking back onto the ship and had a late lunch in the buffet. 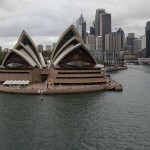 As Hobart was our only day ashore until disembarking (4 nights really is quite short for a cruise! ), we spent our remaining holiday time making the most of the facilities and diversions offered on ‘The Dawn’. 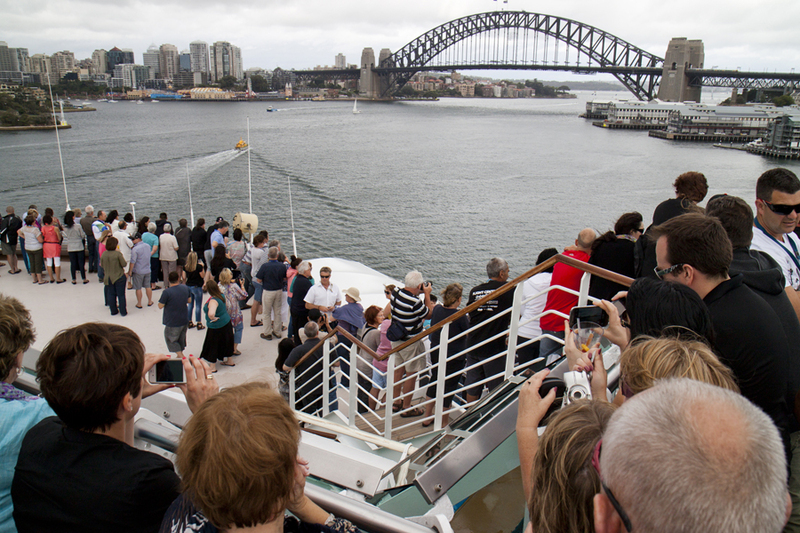 But all too quickly, it came to an end, and we had to say goodbye to our friends and the idyllic lifestyle provided by immersing oneself in the cruise experience. Being in one of the first disembarkation groups we headed out to the terminal and were quickly jolted back to reality by having to wait in a barely moving line for an age to get a taxi. We had had the “bright” idea of NOT paying the fee for the airconditioned bus to the airport, thinking that paying that small amount extra for a cab would provide us with convenience and a car to ourselves. Wrong! After waiting for an hour and a half, a Princess staff member took those airport destination passengers out of the line (and the sun!) and put them on a speedily hired extra coach…for $25 each. I have absolutely no idea where the taxis all were that morning…probably the airport!! So, if disembarking in Melbourne, do NOT go for the taxi queue – it was awful! 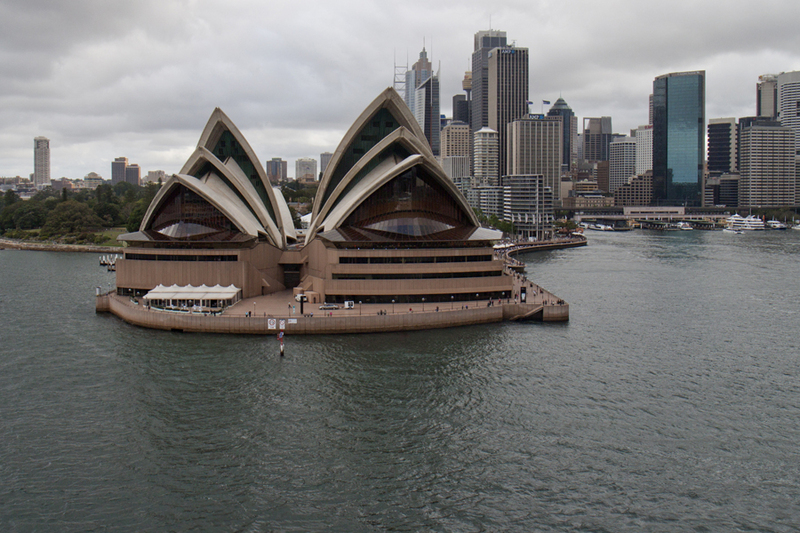 This entry was posted in Australia, Hobart, Melbourne, New South Wales, Sydney, Tasmania, Victoria and tagged Dawn Princess, Hobart, Larks Distillery, Melbourne, princess cruises, Sydney Harbour, Sydney Harbour Bridge, Sydney Opera House, Tasmania, Victoria, Wrestpoint Casino by bontaks. Bookmark the permalink. Dear Nicole, it’s amazing what one finds when trolling through the internet and as the old saying goes – one should never google oneself! I found your amateur (at best) critic of my performance on the Dawn quite upsetting and unfair and given the 4 full standing ovations I received on that voyage I would say you are certainly the minority! You say you saw one full show which hardly makes for an expert opinion and yes it was my last cruise because (not that it’s any bodies business) I’ve been battling a debilitating illness! Not to mention the fact that I would never describe myself as a “Elvis impersonator”! Perhaps before you comment on my performance you could research my career on the internet, read of my industry accolades and reviews and view some of my videos filled with many high notes that are far from as you put it “cringe worthy”!! Unfortunately in my career we have to live but the old adage “your only as good as your last show” which is unfortunate as we can all have a difficult day at the office! I am sure you have had many before you decided to cruise the world. Fortunately I’ve have never allowed my career to be managed by amateur critics otherwise we would all give it up. Australian’s generally in this regard are very good at giving expertless opinion! Well I have news for you, even Pavarotti was booed at La Scala, lucky for him he wasn’t entertaining on your cruise! So it is not as you say “a shame”, after 174 cruises over 12 years I can tell you they didn’t continue to hire me because I wasn’t any good at my job. In future, on your travels, perhaps you could have the courtesy of seeking out the artist and talking to them about their current state before blogging your ill informed critique on the internet. Enjoy the rest of your travels. I am sorry if you have been upset by my remarks. I have removed your name from the body of the post, but I stand by my comments. Nicole, I expected the indignant nature of your reply as your whole blog generally screams the typical “sense of entitlement” attitude I have encounted in many Princess cruisers. I hope you can just enjoy the next one, be less critical and hopefully find more important issues to be opinionated about! It’s all quite sad really and epidemic of this culture less country we live in. People think they know but they are just denying their own ignorance. Hopefully in your career you don’t have to endure the same mindless judgement. Buon Viaggio! Please excuse my interjection Adam, but in my opinion Nicole was being fair. She only said that your high notes were cringe-making and even mentioned that when you did this gig years ago you probably would’ve been stronger. This in no way means she considered your ENTIRE performance horrible. This will come out very harsh but I think you might wanna learn to take gentle criticism even from an “amateur critic” as you say. Considering this is a show on board a cruise and not some deeply historical Native American wolf dance. I don’t think one must require qualifications and in-depth research into the performer simply to deliver some opinions (that may include criticism) on a travel blog.